RenewRI sticker on front page of Providence Journal. 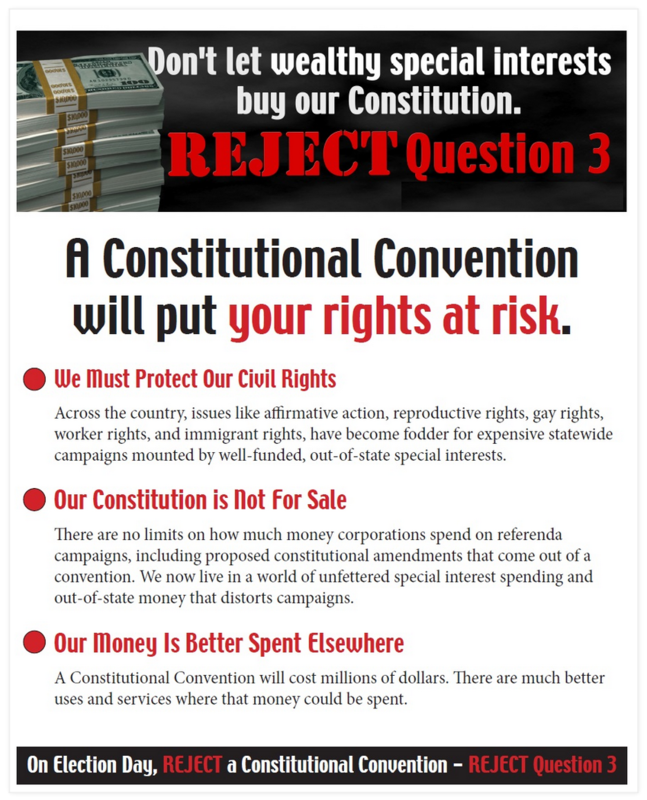 The Rhode Island Center for Freedom & Prosperity has distributed four short videos that are excerpts from a conference it held and that are more social media than mass advertising in nature. RenewRI’s two vote yes signs, one each facing North and South, on Route 95. 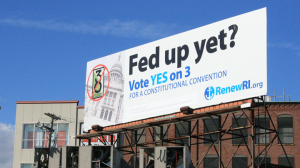 The no and yes campaign signs went up within a few days of each other and were first reported to RhodeIslandConCon.info on October 8. Customized robocalls were widely used. Less visibly, the unions who were opposed to convening a convention sent relevant communications to their members. 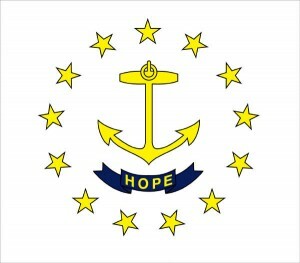 The Coalition for Responsible Government included some 30-40 Rhode Island unions. Disclosures for expenditures for such communications were exempt from campaign finance laws. 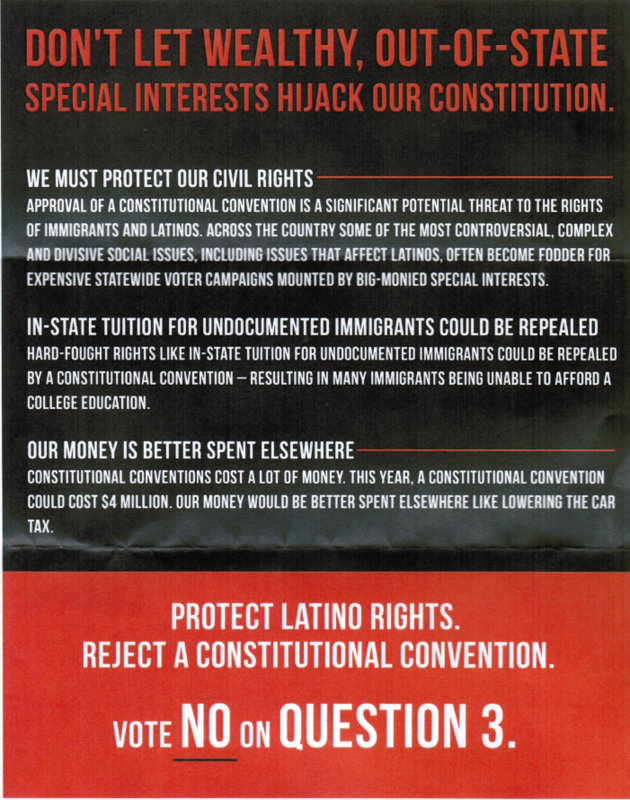 Citizens for Responsible Government mailer to Rhode Island women received on Saturday, November 1, 2014. Discussion of Question #3, from 15:30 to 28:35. 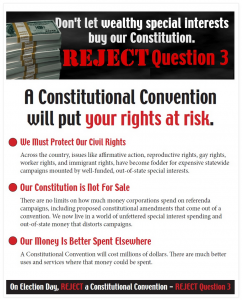 Labor Vision TV – NO on Ballot Initiative Three – No RI Constitutional Convention. From 1:30 to 10:40 (same interviewee but different points). 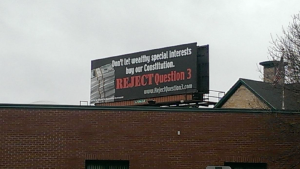 The Rhode Island Board of Elections ruled that the video ad released on September 28, 2014 violated Rhode Island’s campaign finance disclosure laws, and it was taken down. The following ad with the required disclosure at the end was substituted in its place. Woonsocket Teachers’ Union social media. Note: communications to organization members don’t require campaign finance disclosures. 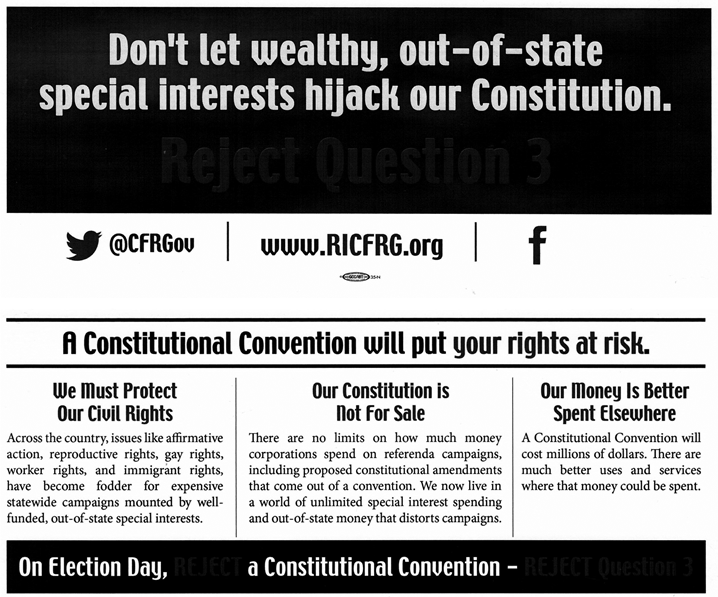 Citizens for Responsible Government handout. 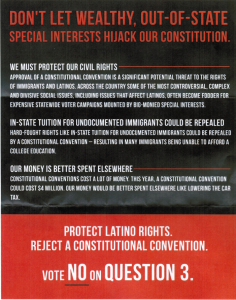 Distributed to a Latino Public Radio political barbecue event on October 18, 2014. The Coalition for Responsible Government’s two vote no signs, one each facing North and South, on Route 95. The no and yes campaign signs went up within a few days of each other and were first reported to RhodeIslandConCon.info on October 8. Citizens for Responsible Government TV ad. 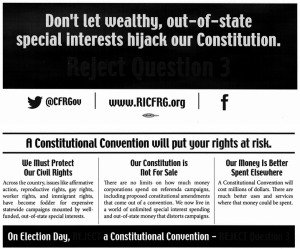 It closely follows the model for the successful attack ad used in Connecticut during 2008. A big difference is that that TV/radio campaign began a week before the election. This one is coming out more than a month before. These are the palm cards Citizens for Responsible Government has handed out. The first one was spotted at a public festival near Brown University on Sunday, September 22, 2014. Discussion of Question #3. From 20:43 to 30:00. Labor Vision TV RI Rep Jack Carnevale, Oppose RI Con Convention. Discussion of Question #3. From 1:15 to 20:48. Paula Hodges heads government relations for Planned Parenthood Rhode Island and is former political director for Missouri NEA (she left Planned Parenthood a few months after this interview). Labor Vision TV – Legislative Issues Paula Hodges Hosted by Jim Parisi.